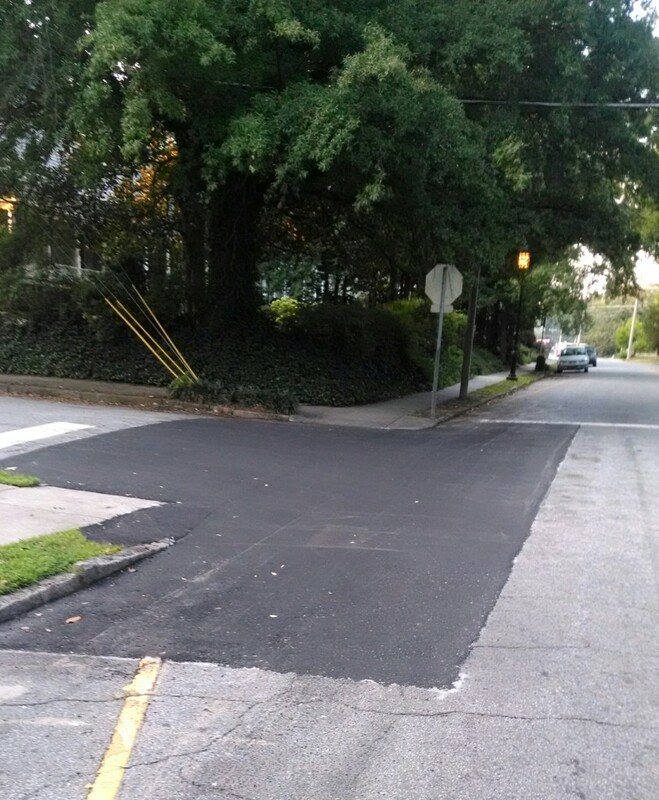 The city has repaved part of the very ragged intersection at West McGee and South Mendenhall streets. The northeast corner, which looked like it had been hit by a very small bomb, was particularly improved (on the left side of the photo). James Keith recently dragged a city engineer over to the intersection while the guy was in the neighborhood on another matter. I don’t think it was even to talk about what awful shape the streets were in right there, but the engineer was struck by it. Whatever the reason was, it’s a big improvement. It may keep fewer cars from bottoming out while heading east on McGee, but you still might want to be a little careful there. This entry was posted in McGee Street, Mendenhall Street. Bookmark the permalink.